Frustrated with productivity losses associated with EHR use, many physicians are keeping close tabs on advancements in mobile, speech-enabled computerized physician order entry. Physicians are striving for workflow efficiency as they balance patient care with an ever-evolving HIT environment. Early on, many industry experts pointed to EHRs as catalysts for creating more efficient workflow for physicians. And while EHRs provide a necessary and tactical foundation for the health care industry’s goals for better care delivery and lower costs, a growing body of research suggests they haven’t necessarily lived up to physician productivity expectations. A 2012 survey by the American College of Physicians and AmericanEHR Partners revealed that EHR satisfaction and physician usability ratings have decreased since 2010, with 34% indicating that they were very dissatisfied with EHRs’ ability to decrease workload. The survey results also indicated that nearly 40% would not recommend EHRs to a colleague because of productivity challenges, difficult software interfaces, and a lack of improvement in patient care. Those findings came on the heels of a 2011 Medical Group Management Association survey that found that more than 30% of responding physicians felt their productivity decreased with EHR use. 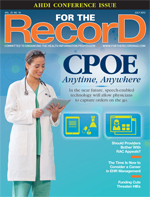 As providers look for the best possible way to meet the computerized physician order entry (CPOE) requirements of meaningful use, many are considering the potential of speech recognition advances to help overcome productivity obstacles—and vendors are responding. According to M*Modal Chief Medical Information Officer Jon Handler, the company is teaming with Utah-based Intermountain Healthcare to prototype and develop a mobile app designed to address speech-enabled CPOE. “This provides the opportunity to meet clinicians where they are,” he says, adding that the mobile app is designed to not only tackle workflow issues but also help eliminate errors. As EHR vendors consider how to support integration with third-party applications such as speech recognition, speech vendors are trying to push the speech-enabled CPOE concept to its full potential. Nuance is responding through its Florence virtual assistant concept, creating a more intuitive way for physicians to coordinate care and improve efficiency through dialogue-driven intelligent systems that hear, understand, and respond. CPOE will be one of many workflows offered through Florence, and the product can be embedded in various health care apps on mobile devices, Web browsers, and desktops. Zimmerman points out that the EPIC EHR has several applications that help physicians become more mobile, plus the Nuance technology already is integrated into those offerings. Although still in the development phase, the plan is for Florence to be able to capture 95% of common orders, according to Belton, who says one challenge is completing the technical work required to get the output into the EHR. “We’re going to be using industry standards,” he says, adding that he hopes more EHR vendors move in that direction to make integration easier. The current M*Modal prototype Apple iOS app allows physicians to speak orders into an iPhone or iPad. Once orders are picked up by speech recognition, they are sent to the M*Modal cloud server, where the company’s speech-understanding engine translates the information into text, Handler explains. The information then is sent back to the clinician—reappearing on the phone—allowing him or her to review and edit the order. Currently, the app is designed to address three primary error classes often connected to verbal orders that get lost in translation. The first focuses on transcription errors where a physician gives a verbal order to another party, but the order is transcribed incorrectly. For example, if a nurse listening to a physician on the phone misunderstands what’s being said and writes down the incorrect order. The second class of errors includes delayed or dropped orders. “We are targeting folks on the go,” Handler says. “It’s incredibly common that people forget.” An example is a physician trying to dictate an order into a CPOE system who gets pulled away or distracted by something else happening nearby. “This technology provides a fast and easy way for clinicians to execute a plan of care at the time they think of it,” Handler says. The final group of errors features internal orders that simply do not make sense. To help combat such occurrences, the app will be designed to offer a decision-support component to question certain kinds of orders. Handler says that during the first phase, the amount of risk will be limited. For example, an oncologist likely would not want to place a complex order for chemotherapy regimens via the mobile app. “Let’s start with obvious, simple wins and build on that success,” he says. The availability of clinical decision support within the CPOE process has been identified as a critical element to the industry’s ability to standardize best practices and meet the aggressive quality expectations laid out in federal initiatives. Both M*Modal and Nuance acknowledge the need for clinical decision support, but they are introducing the capability one step at a time. According to Belton, the first phase of the Florence initiative will entail capabilities to capture what a clinician says, format it, and confirm it based on Nuance’s Dragon technology. Phase 2 will include a decision-support component, possibly in the form of alerting. In the early planning stages, feedback will be gathered from panels composed of physicians and clinical users to ensure Florence meets clinician needs. Nuance will provide the dialog hooks—speech to text, text to speech—and manage the conversations, while its third-party partners ultimately will be responsible for providing the clinical decision-support content. The first phase of the M*Modal project will include rudimentary clinical decision support to reduce a set of common, straightforward errors. For example, if an order is made for a patient to take 72 tablets of aspirin when a typical order would be two, the system would recognize that there could be a potential error and alert the physician. While alerts can help reduce errors and aid physicians in decision making, the reality is that many industry studies suggest that too much alerting will result in a phenomena known as alert fatigue. In a white paper authored by Handler, “The Checkbox Is Not the Patient,” he notes that the industry needs to improve its approach to alerting. Medical literature has identified that only a few alerts actually improve patient outcomes because most are ignored. • Provide the normal range and an abnormal indicator (high, low, critical) next to the lab result to help clinicians properly analyze the result and ensure they notice the abnormal ones. • Provide a cost indicator next to each order in the CPOE system to help clinicians incorporate finances into their decision making. In the end, some form of alerting or decision-support component will be an important consideration for speech-enabled CPOE workflows. Belton points out that one challenge is making sure physicians take the time to give orders a second look for accuracy. Many of the same challenges associated with deploying front-end speech recognition for dictation—where health care organizations have found that it is difficult to get busy physicians to take the time necessary to do their own editing—will have to be overcome to ensure accuracy. One option would be to build a third party into the workflow, Belton says, pointing to physician assistants as potential candidates to provide that assurance of a second set of eyes. — Selena Chavis is a Florida-based freelance journalist whose writing appears regularly in various trade and consumer publications covering everything from corporate and managerial topics to health care and travel.